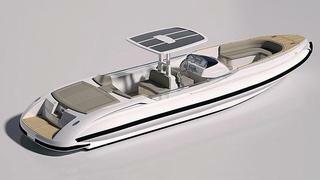 Castoldi will deliver its latest and largest unit, the 9.9m Jet Tender 33 Twin in October 2013 immediately followed by a second in December 2013. The tender is equipped with two of the new Turbodrive 284 H.C. waterjet drives coupled to two Yanmar 6BY-260 diesel engines. Among the many optional features it will be possible to order the ACES electronic control systems (usually installed on work and military vessels worldwide) which allows the tender to perform docking manoeuvers like 360° rotation and sideways through a joystick.